HCM City (VNA) – Party and administration officials in Ho Chi Minh City and the Mekong Delta province of An Giang extended their Christmas greetings to local Evangelical churches on December 18. 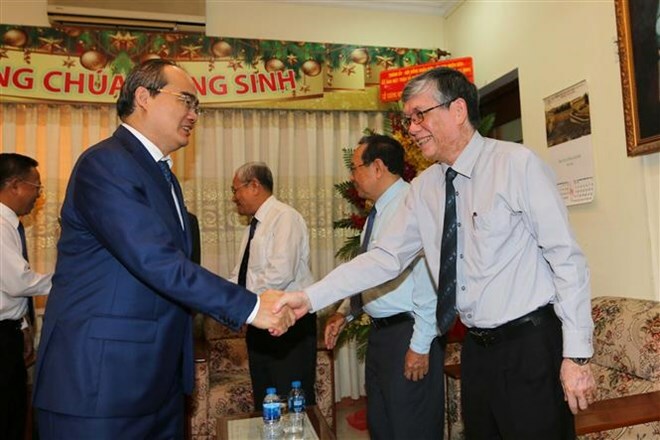 In Ho Chi Minh City, a delegation of senior officials led by Secretary of the municipal Party Committee Nguyen Thien Nhan visited the General Confederation of the Evangelical Church of Southern Vietnam (GCEC). On the occasion, Nhan wished the church’s executive board, Protestant priests, and followers a merry Christmas and happy New Year. He lauded the group’s activities regarding charity and environmental protection over the past year. The official hoped the church would continue working with local organisations and religious committees in arranging important social events, and that Protestant priests and followers would go on to make further contributions to the city’s socio-economic development. Priest Thai Phuoc Tuong, head of the GCEC, thanked the municipal authorities for their support of the church’s activities. He pledged to continue encouraging followers to make active contributions to the city’s growth. Meanwhile, the An Giang delegation, led by Vice Chairman of the provincial People’s Committee Nguyen Thanh Binh, visited the Long Xuyen and Nui Sap Evangelical churches in Thoai Son district, also greeting them with a happy Christmas and New Year. Praising the churches’ involvement in socio-economic development programmes, Binh hoped their executive boards would continue guiding Protestants to join patriotic movements, as well as rural building and charity activities.